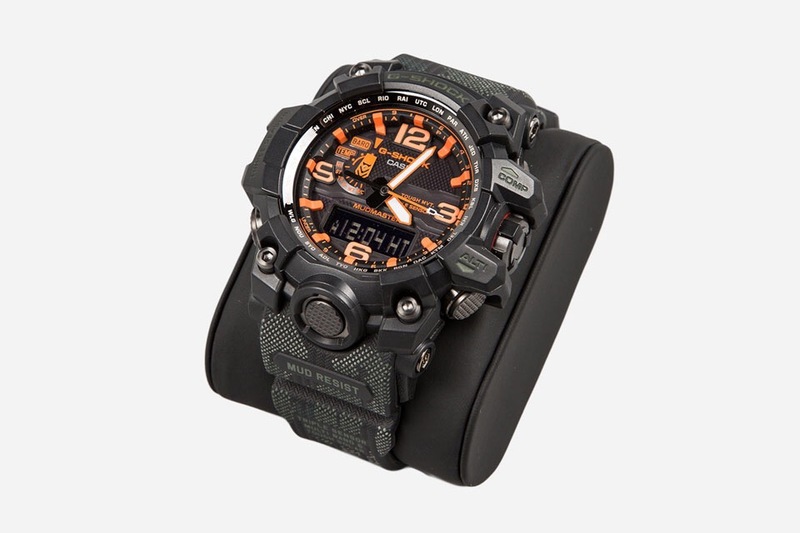 Casio G-SHOCK announces its fourth collaboration with UK-based design brand Maharishi, resulting in this limited edition Mudmaster GWG1000MH-1A timepiece. The watch features Maharishi’s British Bonsai Forest print in a new stretched Camouflage variant, complemented by bright orange luminous indicators on the face. The new Maharishi collaboration timepiece contains all the features that G-SHOCK is known for — including a structure that is Mud, Shock and Vibration Resistant, 200M Water Resistant, Full Auto Double LED Lights, World Time with 29 time zones that include 29 cities + UTC, 4 Daily Alarms and 1 Snooze Alarm, 1/100th second Stopwatch, Countdown Timer, 12/24 Hour Formats, and a day and date display, all in a 56.1mm case. The GWG1000MH-1A drops in December at select retailers, but is currently available for pre-order online here.